356 Holloway Road, London N7 6PA. Please come and meet Dr Brian Potter Chairman (ILA) and ILA Directors. 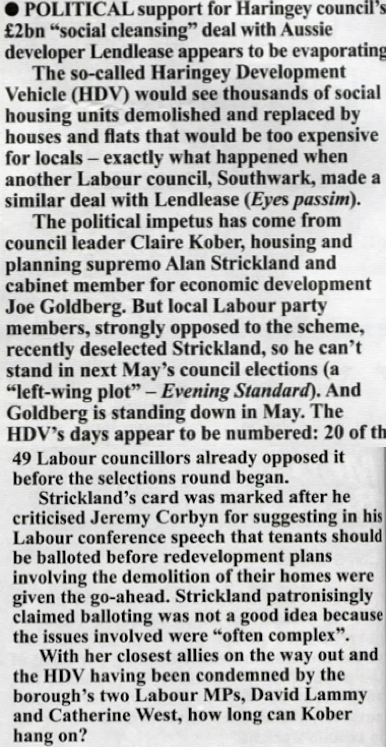 • IF you are an ordinary, working-class council tenant who ever thought Islington’s Labour council was on your side, think again. Our rents and service charges are supposed to be ringfenced for managing, maintaining and repairing our homes. They are paid into the council’s housing revenue account (HRA), as distinct from the general fund, which all households pay into (including council tenants) through council tax. 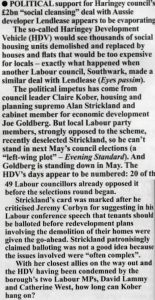 The council, though, has just been exposed (in Inside Housing magazine) for using a loophole to raid the HRA to pay for “democratic and corporate core services”. While other councils have likewise been caught out, Islington has taken much more from the HRA than others. In 2014-15, 44 per cent of the cost of its “democratic and corporate core services” was taken from its HRA, while the London average (still inexcusable) was 6.9 per cent. This has been going on for years, with the percentage hiked up six per cent from 2011-12 to 2014-15. Presumably, at the very least, the outgoing Islington housing lead member, now Deputy London Mayor, James Murray would have to have been aware that our rents are being used to subsidise other households, including some of the country’s wealthiest middle class. All tenants’ and residents’ associations should demand that the HRA raids stop and that any money taken for “democratic and core services” be paid back, especially as many of us struggle to get basic repairs done on our estates and are told that the budgets which council TRAs might bid for (for estate improvements) could be cut.